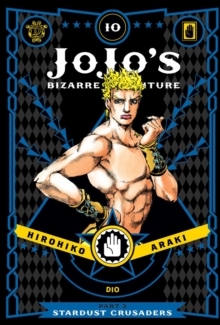 JoJo's Bizarre Adventure is a groundbreaking manga famous for its outlandish characters, wild humor and frenetic battles. Are you ready to witness the brutal battle between Jotaro Kujo and Dio? Are you prepared for Star Platinum vs. The World? Our heroes are finally at the finish line, but Dio's overwhelming power may just be too much for them to handle. It's the beginning of the end! Everything has been building to this moment! Will Jotaro overcome the greatest challenge he's faced in his life, or will Dio finally get his revenge on the Joestar family? !